A whole new year ahead. I'm still getting used to the idea. It's a funny thing, and I find myself being so fickle. All I ever want sometimes is change and then if something does change.... I'm just not so sure about it. But today is a day of planning and organization, which I quite enjoy. Like a piece of watercolor paper before you put the first stroke down. So exciting. Suddenly the color hits the paper and Bang! You're off and things start coming into focus. Each area becoming more detailed and all the colors getting richer and more wonderful. One of the places on my forever bucket list to visit is Hallstatt Austria. As I was musing through what my inspiration would be for this year, and inevitably past inspirations rolled back to me. These snowy hill tops came into my minds eye. Moody Hues and high mountain peeks never fail to breathe new life into me. Remember the concept images and brands that I shared with you in my blog post a few weeks ago? I planned and curated some of my favorite fellow small business designers to come to Philadelphia and Pop Up with me! and look how beautiful it all turned out?? I was so excited that these really beautiful brands were all interested in showcasing their work alongside mine and others. It turned out to be a really wonderful event and I'm still missing all the fun and how beautifully this space was all weekend! It was particularly special to me to have each one of these brands here because they were ones that I personally connected with and that I felt communicated a similar aesthetic and lifestyle that our customers would resonate with. Our opening night was a smashing hit- we were only without customers for a few moments here and there- which happens to be when we took all of our photos. If you love anything you see, we are all shopable online! We popped up for both First Friday in Old City Philadelphia and Saturday all day! We had mocktails and little lemon glazed madelines for our guests to munch on as they shopped. We loved getting to connect with old friends and new clients who came into our space. We had a lot of traffic in and out of the space both days; Possibly our favorite was a group of ladies brunching Saturday morning who got dropped off right in front of our shop! We loved chatting with everyone and so appreciated everyone who came out. I sold entirely out of my calendar stock at this event and had to re-order when I got home Saturday night! So if you're waiting on a calendar- they are coming to you!!! I promise! Kaitlin Chow- (who took all these beautiful photographs for us) made sure our display looked really sharp by lighting it beneath the glass table. She and I both went to Interior Design school together and are now perusing other art forms. I loved displaying with her because I have always admired how precise and articulate she is as an artist and while we sometimes approach similar subject matter- we're totally different. Skeem Design's candle's infused the space with the most amazinngggg scents. Everyone who waltzed in the door kept gasping at how amazing it was. Their beautiful display knocked my socks off. Part of their concept is to eliminate unnecessary packaging and all of their products you could use again once the candle or matches are gone. I love love their fireplace matches and the cork bottles. If you're looking for a retail location for them- I spotted them at Anthropologie a few weeks ago, or you can purchase from their site. Madda and Co's bags really drew in the crowd. 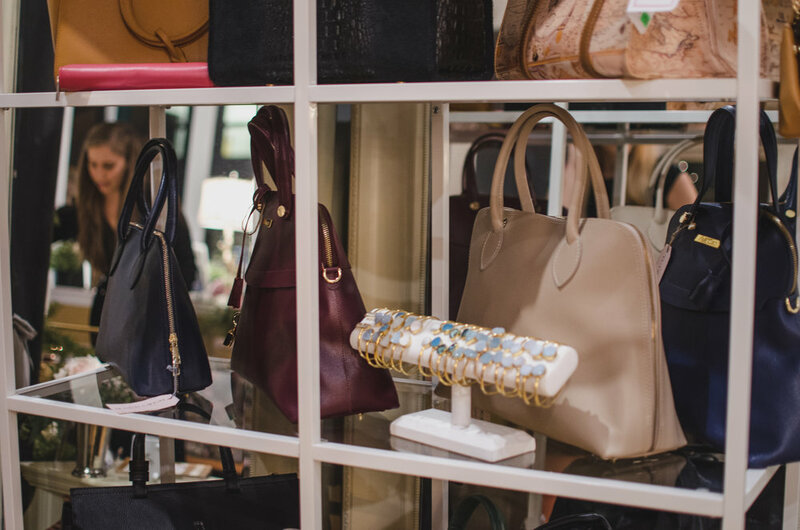 Manufactured in Italy and designed in PA, Madda's bags are everything for the modern women. She also has a line of handbags that she features from other designers in her line that are really gorgeous as well. We used Madda's Ambiance bag and clutch in our window display. And Andrea's display was more beautiful than I could have imagined? Like the best jewelry box you could ever have. Every single one of her designs is simple and beautiful and speaks to women of many different personalities and ages- which I think is why her line is always such a hit. I got some aqua tassel earrings that I've been swooning for months. Our mutual friend Rhiana from Wear Bows and Smile blog has them in multiple colors and they look so, so beautiful on her! She featured them in black in her latest post here! You can see MY PILLOW LINE!!!!! With the beautiful and adorable Miss.Lilo! Thank you if you came out to this event! Thank you if you followed along! Thank you if your purchased from us and are supporting us! We love you! Brands on Display: Jewelry: Andrea Del Bello, Handbags: Madda & Co, Art: KchowStudios and Lydia Marie Elizabeth, Dresses and Apparel: Virginia Dare Dress Co, Candles and Matches: Skeem Design, Home Decor (Pillows): Lydia Marie Elizabeth. Can you believe we forgot to take a group shot?? Here are a few of us at the end of Saturday night! !